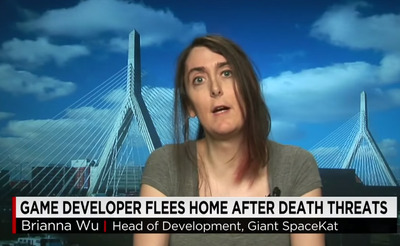 YouTubeBrianna Wu appeared on CNN to talk about the death threats she received. Brianna Wu, who has found herself in the middle of the GamerGate controversy, is offering a reward for information about people who have been harassing her. Wu and her husband left their home last month, following death threats she received on Twitter. Based on tweets from Wu, the harassment seemed to be in response to a meme Wu created poking fun at the “GamerGate” movement. Wu is head of development at game developer Giant Spacekat. The Wu family is offering a reward of $US11,000 for identifiable information leading to the prosecution of people sending me death threats. The GamerGate controversy involves death threats via tweets (or comments on blogs) aimed at women who have criticised sexism in the gaming industry. The GamerGate camp is composed of people who believe that the reaction to those threats is overblown, or that some of the threats were scams on the part of the women or that the men who play video games are the real victims, as they are being painted as misogynists. The intricacies of GamerGate are complicated and the irony is that both sides of the issue are claiming that they are being harassed and bullied. Some video game fans say that journalists and game developers are too close, and are calling into question the ethics of video game journalists. But it quickly devolved into harassment of women in the industry. Supporters of the idea that it is the gamers being victimized, not women who have receieved threats, have rallied behind the “GamerGate” hashtag on Twitter and elsewhere. The hashtag is being blamed for various threats against women. Anita Sarkeesian, who recently canceled an appearance at Utah State University after death threats, says at least one of the many threats against her and feminists at the university claimed affiliation with GamerGate. Wu has talked openly about her experience in the media and on Twitter. She’s even in the process of setting up a legal defence fund for other women who have been harassed by the GamerGate movement.